Showing results for tags '#u2ieTour'. 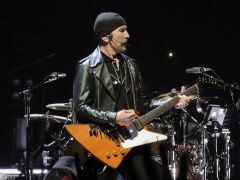 The Edge Plays "I Will Follow" at the Pepsi Center, Denver, Colorado, June 6, 2015. #U2ieTour is, at its heart, about home. 'A place called home' Bono calls, as he answers his own question 'What do you want?' in the Zooropa into Streets segue in recent shows. Home can be defined in many ways, as many things, and fans this year have found a new online 'home' of sorts, a place where we gather as each show has ended, to chat, engage, hang out... The Crystal Ballroom. Just ahead of the band returning home and the first of 6 dates in Ireland, beginning in Belfast, the Zoo caught up with host Tim, the @U2Professor who told us all about it, in his own words : The Crystal Ballroom is hard to describe. It really doesn’t fit any of the common categories—it’s not a website, it’s not a forum, it’s not a podcast. But it’s also a little bit of all those things. I often tell people its part television, part chat room and part radio call-in show—kind of a mini Zoo TV on your phone. If you’ve never heard of the Crystal Ballroom, that’s understandable. We’re the new kids on the block, about as old as the #U2ieTour itself, which makes it really thrilling to be named the Fan Site of the Week. Thank you, Zootopia and all the U2.com crew who have so graciously supported us! So, what is the #U2CB (as it’s become known in the Twitterverse)? Basically, it’s me, Tim Neufeld, and a virtual community of passionate people. In this little digital sphere of fandom, I use the Periscope app to engage anyone interested in talking about U2. In the real world, I’m a professor of biblical studies at Fresno Pacific University, where I teach a course called “Theology, Culture and U2.” I’m also on staff with atu2.com, and I’m writing a book (out in fall of 2016 through Rowman and Littlefield) about the interplay of U2 and culture. Some fans have cheekily renamed me as the “@U2Professor,” which is quite humbling—I’m not worthy! The Crystal Ballroom is an organic experience that has evolved purely by chance. After attending the second concert in San Jose, California, on May 19, I had a three-hour drive back to Fresno. I had already seen both Vancouver shows and loved them, so on a whim, I had my wife, Tracy, open up the Periscope app and start broadcasting with the simple title of “U2”. You know that feeling when you leave a U2 concert and you immediately want to talk with someone else who has also been at the concert, trying to remember all the details before they become quickly fading memories? That was me and Tracy on the long, late-night drive home. About 20 or 30 people hung out with us for a couple of hours online that night, though more than 100 had popped into the conversation for at least a few minutes. I was actually quite surprised by the number of viewers. So, when the Phoenix concerts rolled around a few days later, I started another broadcast from my home in Fresno as soon as the first show was over, this time with the title, “Anyone want to talk about U2?” As unsophisticated and simple as it was, people really seemed interested in chatting about this tour. The Crystal Ballroom (though not yet known by that name) has also broadcast from #U2ieTour live shows, which has helped greatly in gathering viewers. We were a little worried in Los Angeles when we first tried that because no one had done that before—we weren’t sure if we’d get in trouble. Bono though gave a shout out to Periscopers in the house during the Meerkat feature from Boston and soon after the Crystal Ballroom even caught the attention of a German radio news station who did an NPR-style story on us! After one of the other LA shows, I streamed another post-concert broadcast with the title, “U2 chat in the Crystal Ballroom,” a clear nod to the song of the same title. It stuck. Since then, I’ve incorporated music, visuals and other support material. I’ve even included guests like Matt McGee (the founder of atu2.com), Beth Nabi and Chris LeClere (who together make up the U2 Tattoo Project), Mirrorball man Mark Baker and Bigwave here in Zootopia. I try to stream a chat after every concert, though it doesn’t always happen on the European leg due to my work schedule. We celebrated our 50th post-concert chat a couple of weeks ago. That’s something I never could have predicted, especially since the technology for this kind of experience didn’t even exist nine months ago. At the Madison Square Garden shows, I met many U2 fans from around the world who had regularly tuned into the broadcasts. Besides North America, we have “Crystalheadz” across the globe now in Holland, England, Australia, New Zealand, Brazil, Mexico, France, Italy, Greece, Ireland and many other distant places. It’s become an amazing international community, usually with hundreds of participants per broadcast. And while we really don’t have a staff (though “Mrs. Crystal Ballroom” is a big part of it), we recently had a meetup in California which brought out some great supporters. Specifically, Suzen Avakian, Jeff Long and Tesh Ewing took the lead, planning a great celebration for 25 excited U2 fans (we were supposed to have more, but our weekend coincided with the tragic Paris attacks, causing some to change plans). It was the first real-life gathering of our virtual community. I hope there will be many more. In the Crystal Ballroom we are trying to do four things: (1) create community by pulling down the dividing walls, (2) build a learning environment where everyone can contribute to the discussion, (3) promote active engagement on important issues such as the refugee crisis in Europe, and (4) consider U2’s own music, art, activism and spirituality. That all sounds a bit stuffy, and sometimes it’s quite solemn, but usually we have a lot of fun. It’s become another way we get to carry each other. After all, U2 makes it easy, giving us a great time alongside challenging and provocative issues. That’s what sets this band apart from all others. Please come join us! You just need to load the Periscope app to your device and follow me at @timneufeld, or watch my Twitter feed @timneufeld and click on the links. You can also see replays on our YouTube channel, follow us on Facebook, or read my personal blog (I also try to post links to live streams during U2 concerts on my blog). The hashtag #U2CB works on Twitter as well. In the end, I am not the Crystal Ballroom, but just one of its host of love - it belongs to the really great, thoughtful and warm spirits who haunt the place. We’re a caring and welcoming community, always looking for looking for another “soul that’s real.” Stop by sometime! From everything that I've read, the band is back in the studio, writing, recording and working hard at getting the next album out. I was little hopefully that that would be touring again this year. But it's June and I don't think that is likely. My guess is the earliest that they could possibly hit the road is 2017. U2 Valencia posted today that U2 maybe launch the Live in Paris Bluray / DVD in june 10. It seems to be a compilation with shoots from the 4 recorded concerts. Paris, France in the Autumn is such a beautiful sight to behold. The #U2ieTour has arrived, and this week the Zoo spoke to Judith from French U2 fan site U2Achtung. Bonjour les amis ! We are very happy to have the opportunity to present our French website and community to the Zootopians. U2Achtung was created 15 years ago in 2000 by Bert, Coco and Fab. The team members have changed a lot over the years, people joined and left, but today, the U2Achtung team is made up of Judith, Nadine, Antoine, Benjamin, Florian, Loïc and Matthieu. We are from France, Belgium and Switzerland, but our community is open worldwide, even if we focus on the French speaking fans. Many people have helped, too many to mention, and we thank them very much. Without them, we are nothing. Like other websites in different countries, we provide daily news for our followers about U2, their music, tours and projects. Visitors are also able to find a very rich content about U2 releases, biography, videography and bibliography too. We even translate their lyrics in French. On U2Achtung.com, there are two main areas: a chat forum (in a free section) with over 12,000 members, and the Club U2Achtung (annual subscription access). On the Club U2Achtung site, there are exclusive sections and we regularly organize contests for our members. We give away concert tickets, books, CD, LP, and so on... and of course we are very present on social networks too, like twitter and Facebook Almost every year, we organise a cover contest that we call “Achtung Awards”. It takes place on a dedicated web page of ours and people vote for their favourites. It is a very interesting way to discover new talents among our community, but also to hear some amazing work done on U2 songs, that sounds really professional. It could nearly be on an official U2 Remix CD! It’s open to every musician, and on our last edition, we even had foreigners taking part, who we helped going through the French website. And as we like to work for the fans and U2, we created two mini websites for the big anniversaries of War (30) and Achtung Baby (20). You should take a look, we think our web designer did something great! 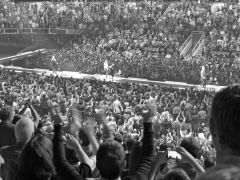 Over the years, U2Achtung has managed to create strong links with the fans and the record label, so that we organised many events and special occasions. One of the first big fan event in France was the Zoo TV DVD screening at the famous Paris venue “L’Olympia”, in the presence of Michka Assayas, author of Bono par Bono. Our website had invitations to give away for that memorable night. The writer even tried to call Bono in front of everyone, but only got the answerphone. We also managed to get two members of the team to an exclusive listening of No Line on the Horizon in 2009, and we offered tickets twice for a TV show (Le Grand Journal) in 2009 and 2014 where U2 were the musical guests. We even more recently gave away 2 tickets for the Dublin shows in November! A lot is happening within our community, especially through our forum where people can chat, trade tickets, plan trips together to see U2 abroad and meet even when there is no tour. And when there is no U2 activity, people talk about other bands, cinema, their jobs, etc. For many of them, it’s really a part of their daily life. And it’s also a place where friendships were born, have grown and where love stories started, leading to some marriages and U2Achtung babies. Every fan knows that U2 loves France, they always spend a few weeks or months here, in the South. And France loves U2 as well. We showed them this never-ending love and passion on several occasions, like in Stade de France in 2005 with the “White Balloons” initiative, which we repeated in 2010. It was a success and the band publicly said in 2005 that it was an amazing surprise. Now with the 4 U2 shows in Paris this week, we couldn’t be more excited to have U2 back here, especially in arenas, 14 years after the Elevation Tour. For this occasion, we designed an original T-shirt, available through our website. You may bump into fans wearing those t-shirts in Paris. And also, as it’s always a celebration when U2 comes to France, we are going to throw a party on November 13th at Pub O'Connells in Paris, with the help of Universal Music France and French radio Oui FM. Fans from all over the world will be able to meet, dring, sing along watching lives and win more gifts! See you soon in Paris!!! C'est parti ! Got a question for @U2? Ask now via twitter using #U2ForParis & they'll answer on Mon @ 8PM ET before the @HBO broadcast. As the #U2ieTour arrives home to Dublin, in the final U2 FSOTW feature for this year, the Zoo managed to grab a chat with Matt McGee, founder & editor of one of the longest running U2 fan websites - @U2. They were there at the beginning of this tour in Vancouver and many of their team are making the pilgrimage over to Ireland this week to see the 4 shows. As he was packing his suitcase, we asked Matt to tell us about atu2.com, and what this year has meant to him. In his own words : "I have a confession: I don't like the term "fan site." More often than not, when you tell someone that you're involved with a fan site for a music artist, they instantly think you're Chris Farley trying to have a coherent conversation with Paul McCartney. Back in the day, in fact, when we were just beginning to develop relationships with various music industry professionals, I'd go out of my way to explain that I was a stable, married, adult male, not a 15-year-old kid with pimples all over my face... But confessions aside, it's an honor for all of us involved with @U2 to be chosen "Fan Site Of The Week" as U2 arrives home for four shows in Dublin! It's such a privilege to be able to see the band play in its hometown. I vividly remember seeing the two PopMart concerts at Lansdowne Road Stadium and being overcome with emotion as I heard songs like "I Will Follow" and "Sunday Bloody Sunday" -- songs that were written and recorded just a few miles away. @U2 turned 20 years old last month. Twenty years is a long time to do anything, much less work on an all-volunteer fan site. But doing @U2 is as much fun as it is work, and that's thanks to three things: U2's ongoing greatness, the wonderful group of fans that have worked on @U2, and the generous readers that have said so many kind things to us and about us over the years. Thank you, all. @U2 has a team of about three dozen fans that work on various aspects of the website, and many of us are in Dublin for this week's shows. We'll be there, of course, to enjoy this incredible Innocence + Experience tour -- but also to share it with U2 fans around the world who can't be with us this week. That's always been our purpose: "to bridge the distance between the band and its fans." That's a quote from the 17-page "welcome guide" that we give to U2 fans when they first join our staff. (Yep, we really have such a document and it's really 17 pages. I'm Irish. Brevity has never been a strength.) When @U2 began 20 years ago, we bridged that distance primarily by posting news sent in to us by fans around the world. The snowball effect kicked in quickly: The more news we posted, the more new readers came to the website. The more new readers came to the website, the more they sent in additional news to be posted. That attracted even more readers, and on and on it went. In the late 1990s, based on reader requests, we started writing original news stories, commentaries and personal essays about U2, the music, concerts and even about being a U2 fan. In 2001, about a week before the tragic attacks of 9/11, we started posting a weekly column called "off the record....". More than 14 years later, that column is still going strong and is one of our most popular features. Today, @U2 has a library of more than 8,400 articles about U2, including what we believe is the first newspaper article ever written about U2 -- a March 1978 piece recapping the band's victory in the Limerick Civic Week talent contest. Today, we still take great pride in our news reporting, but we're much more than just a U2 news site. We have a group of fans working on our Tours site, going back and listening to every known live recording of U2 concerts to confirm that our setlists are as accurate as possible. We do a weekly podcast. We have a complete U2 lyrics site, a calendar of upcoming U2-related events and -- lest anyone think we take U2 or ourselves too seriously -- we have 15 years worth of hysterical U2 cartoons in a feature we call Achtoon Baby. We've also become pretty well known for our live events, which date back to 2003 when the Rock and Roll Hall of Fame and Museum asked us to co-host an international U2 fan party during their U2 exhibit. We've hosted numerous album- and tour-related parties since then, including one this summer that made headlines around the world when The Edge and Adam crashed our 20th anniversary celebration and played two songs with our special guests that night, the tribute band Unforgettable Fire. It was an amazing and unforgettable night for all of us, and we don't consider it just a gift for @U2 -- it was a gift for the entire online U2 fan community. It was U2 doing their part to bridge the distance between band and fans, and doing it in amazing fashion. That party, and really this entire year of Innocence + Experience, has been a real blessing for all of us involved with @U2. We were there in Vancouver to watch it begin, and we're thrilled to see it wind down this week in Dublin.